Early American art during the Civil War period, AD 1861-1865, was characterized by various inexpensive materials. Because it was inexpensive, charcoal was a favorite media during this period. 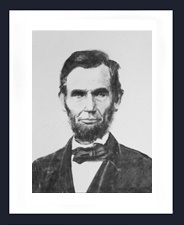 Join Sharon Hofer as she teaches students how to create a portrait of one of America’s greatest Presidents, Abraham Lincoln. It was Abraham Lincoln who guided the United States through the Civil War. This project has a difficulty of Level 4 and will give those who wish to draw a portrait an exacting method in which to draw so that their portrait will clearly resemble the person drawn.